Have you ever heard the term “living fossil”? No, we are not talking about great grandpa. We are talking about Xiphosura, the Horseshoe Crab. The Horseshoe Crab is fascinating! It has hardly changed at all in the past 200 million years and is just about the only Arachnid that lives in the sea. They are not swimming spiders (that would be creepy), but are classified by scientists as part of the Arachnid group of animals, like other land spiders are. At home, in the mid-Atlantic region, off the North American coast between Virginia and New Jersey, Horseshoe crabs are bottom dwelling or Benthic critters. The Xiphosura crabs live on the sandy ocean floor about 100 feet deep. They only come up to shallow waters when it’s time to breed. Xiphosura Horseshoe crabs are a member of the Chelicerae species and have a hard, dome shaped carapace that protects their entire body. It can grow up to two feet long and one foot wide, but the only way it can do that is by molting. 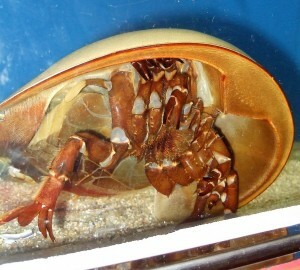 The carapace must be shed, like the skin of a snake, for the Xiphosura Horseshoe crab to grow. The two sections of the Xiphosura’s body are called the Prosoma (head) and the Opisthosoma. Behind the Opisthosoma and elongated into a spiny tail is the Telson. The Telson, though it looks like a sword, is not used as a weapon or for defense. The Sea Arachnid crab uses this spiny extension for navigation, burrowing into the sand and to help flip itself over, if it gets tipped onto its back. 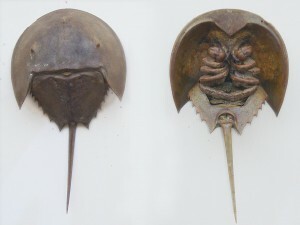 On the underside of the Opisthosoma are the 10 legs of the Horseshoe Crab; four pairs are walking legs and end in a pair looking like little pincers. The inner sides of their 8 legs are covered in Gnathobase, which means little spines. They help tear up the food for dinner, before getting it into the mouth of the Xiphosura. Almost like how you might tear off a chunk of bread with your hands before eating it, rather than chewing on the loaf. What do horseshoe crabs eat? They eat mollusks, worms and other invertebrates. Horseshoe crabs have four eyes: Two compound eyes on the side of their carapace and two simple eyes on the front. The Horseshoe crab’s fifth pair of legs actually has neither spines nor pincers. This pair is used primarily for digging into the ocean bed of sand, or for cleaning the crab’s gills. Males also use it for hanging onto the female, while she lays her eggs, so they immediately fertilize the eggs. The female Xiphosura lays eggs in the sand, lots of eggs, like around 100,000 of them, and then the male fertilizes them. Question: Why are Horseshoe Crabs Arachnids? Answer: Horseshoe crabs (Xiphosura) are more closely related to spiders and scorpions (Arachnids) rather than to crustaceans. The difference is that crabs have an antennae, but horseshoe crabs don’t. Additionally, the Xiphosura have 10 legs while other crustacean crabs only have 8 walking legs and 2 claws. 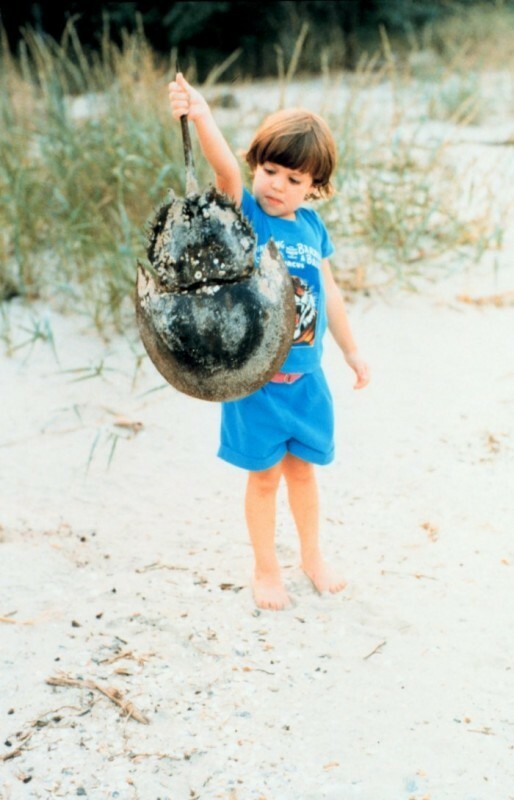 Question: Are Horseshoe Crabs endangered? Answer: Yes, unfortunately. 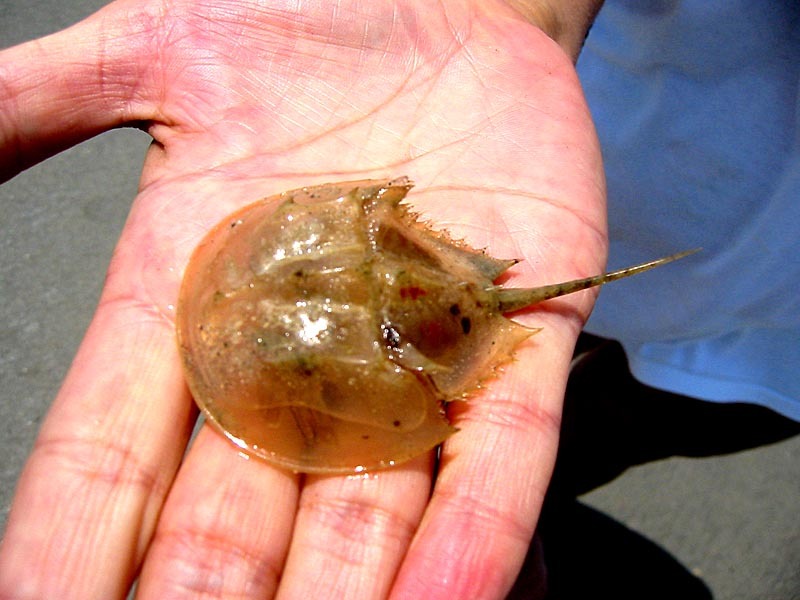 The Japanese Xiphosura horseshoe crab lives in the Seto Inland Sea. It’s endangered, due to loss of habitat. The other Sea Arachnid Xiphosura Horseshoe crabs, who live elsewhere, are harvested for use in the fertilizer industry and for bio-medical research. 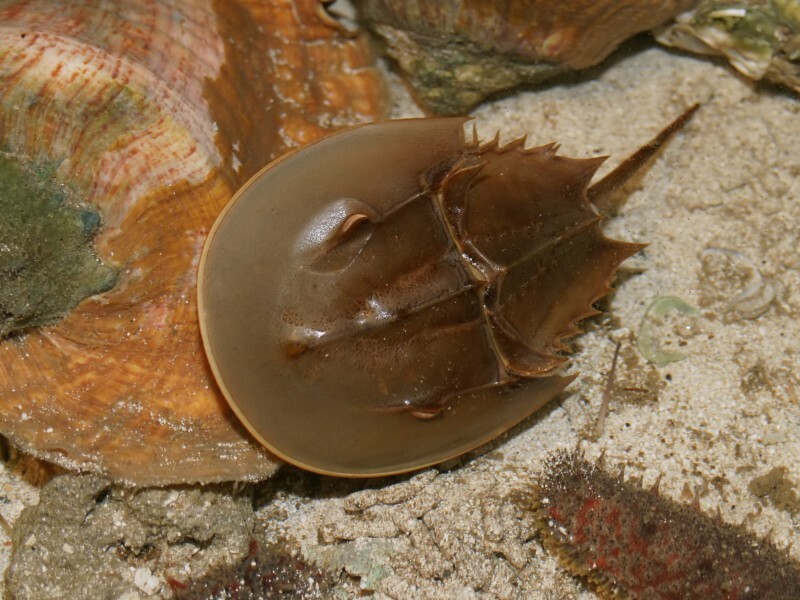 Enjoyed our Fun Facts about the Horseshoe Crab Xiphosura? Take the FREE & fun Xiphosura quiz and download FREE Xiphosura worksheet for kids. For lengthy info click here.